THE men-of-war in which Anson (1) went to sea were built mostly of oak. They were painted externally yellow, with a blue stripe round the upper works. Internally, they were painted red. They carried cannon on one, two, or three decks according to their size. The biggest ships carried a hundred cannon and nearly a thousand men. The ship in which this famous voyage was made was of the middle size, then called the fourth-rate. She carried sixty cannon, and a crew of four hundred men. Her lower gun deck, a little above the level of the water, was about 140 feet long. She was of about a thousand tons burthen. Though this seems small to us, it is not small for a wooden ship. It is not possible to build a long wooden ship. The Centurion, though short, was broad, bulky, and deep. She was fit for the sea. As she was built more to carry cannon than to sail, she was a slow sailer. She became slower as the barnacles gathered on her planks under the water. She carried three wooden masts, each fitted with two or three square sails, extended by wooden yards. Both yards and masts were frequently injured in bad weather. 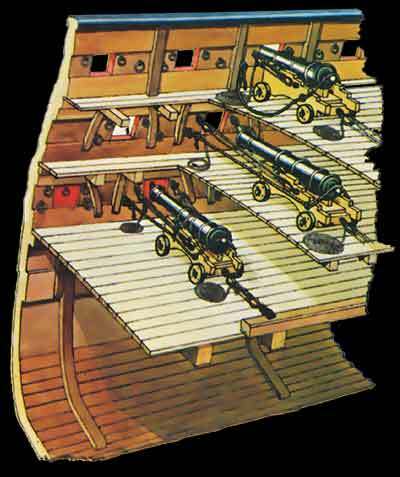 The cannon were arranged in rows along her decks. On the lower gun deck, a little above the level of the water; she carried twenty-six twenty-four-pounders, thirteen on a side. These guns were muzzle-loading cannon which flung twenty-four-pound balls for a distance of about a mile. On the deck above this chief battery, she carried a lighter battery of twenty-six nine- or twelve-pounder guns, thirteen on a side. These guns were also muzzle-loading. They flung their balls for a distance of a little more than a mile. On the quarter-deck, the poop, the forecastle, and aloft in the tops (the strong platforms on the masts), were lighter guns, throwing balls of from a half to six pounds weight. Some of the lightest guns were mounted on swivels, so that they could be easily pointed in any direction. All the guns were clumsy weapons. They could not be aimed with any nicety. The iron round shot fired from them did not fit the bores of the pieces. The gun-carriages were clumsy, and difficult to move. Even when the carriage had been so moved that the gun was accurately trained, and when the gun itself had been raised or depressed till it was accurately pointed, the gunner could not tell how much the ball would wobble in the bore before it left the muzzle. For these reasons all the effective sea-fights were fought at close range, from within a quarter of a mile of the target to close alongside. At a close range, the muskets and small-arms could be used with effect. The broadside cannon pointed through square portholes cut in the ship’s sides. The ports were fitted with heavy wooden lids which could be tightly closed when necessary. In bad weather, the lower-deck gun ports could not be opened without danger of swamping the ship. Sometimes, when the lower-deck guns were fought in a gale, the men stood knee deep in water. In action the guns were run out till their muzzles were well outside the port, so that the flashes might not set the ship’s side on fire. The shock of the discharge made them recoil into a position in which they could be reloaded. The guns were run out by means of side tackles. They were kept from recoiling too far by strong ropes called breechings. When not in use, and not likely to be used, they were “housed,” or so arranged that their muzzles could be lashed firmly to the ship’s side. In a sea way, when the ship rolled very badly, there was danger of the guns breaking loose and rolling this way and that till they had knocked the ship’s side out. To prevent this happening, clamps of wood were screwed behind the wheels of the gun-carriages, and extra breechings were rove, whenever bad weather threatened. The great weight of the rows of cannon put a severe strain upon the upper works of the ship. In bad weather, during excessive rolling, this strain was often great enough to open the seams in the ship’s sides. To prevent this, and other costly damage, it was the custom to keep the big men-of-war in harbour from October until the spring. In the smaller vessels the strain was made less by striking down some of the guns into the hold. The guns were fired by the application of a slow-match to the priming powder in the touch-holes. The slow-matches were twisted round wooden forks called linstocks. After firing, when the guns had recoiled, their bores were scraped with scrapers called “worms,” to remove scraps of burning wad or cartridge. They were then sponged out with a wet sponge, and charged by the ramming home of fresh cartridges, wads, and balls. A gun’s crew numbered from four to twelve men, according to the size of the piece. When a gun was trained aft or forward, to bear on an object before or abaft the beam, the gun’s crew hove it about with crows and handspikes. 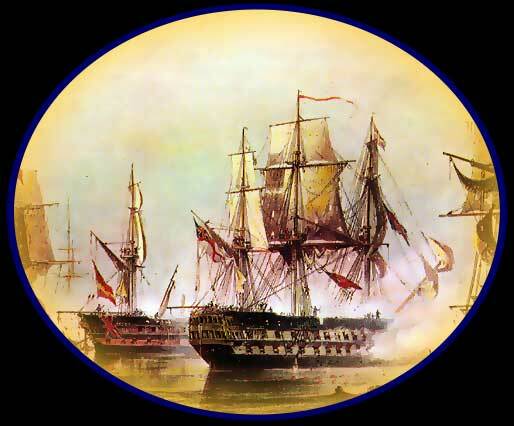 As this, and the other exercise of sponging, loading, and running out the guns in the heat, stench, and fury of a sea-fight, was excessively hard labour, the men went into action stripped to the waist. The decks on those occasions were thickly sanded, lest the blood upon them should make them too slippery for the survivors’ feet. Tubs of water were placed between the guns for the wetting of the sponges and the extinguishing of chance fires. The ship’s boys carried the cartridges to the guns from the magazines below the water-line. The round-shot were placed close to hand in rope rings called garlands. Nets were spread under the masts to catch wreck from aloft. The decks were cleared for action.” All loose articles about the decks, and all movable wooden articles such as bulkheads (the partitions between cabins), mess-tables, chests, casks, etc., were flung into the hold or overboard, lest shot striking them should splinter them. Splinters were far more dangerous than shot. The ships of war carried enormous crews. The Centurion carried four hundred seamen and one hundred soldiers. At sea, most of this complement was divided into two watches. Both watches were subdivided into several divisions, to each of which was allotted some special duty, as the working of the main-mast, the keeping of the main deck clean, etc., etc. Many members of the crew stood no watch, but worked at special crafts and occupations about the ship. 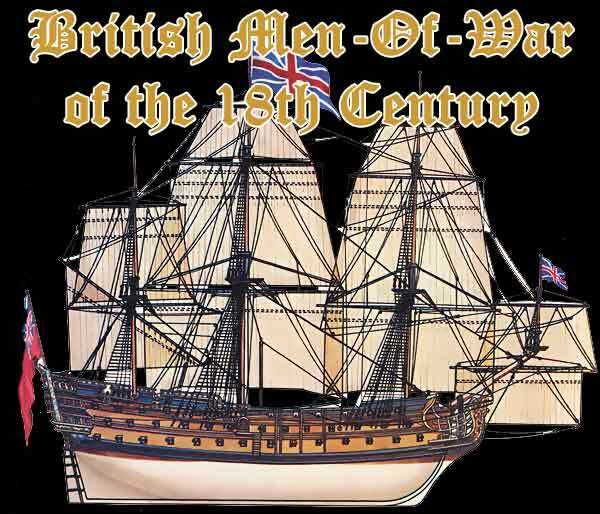 A wooden ship of war employed and kept busy a carpenter and carpenter’s mates, a sailmaker and sailmaker’s mates, a cooper and a gunner, each with his mates, and many other specially skilled craftsmen and their assistants. She was a little world, carrying within herself all that she needed. Her daily business required men to sail her and steer her, men to fight her guns, men to rule her, men to drill, men to play the spy, men to teach, preach and decorate, men to clean her, caulk her, paint her and keep her sweet, men to serve out food, water, and intoxicants, men to tinker, repair, and cook and forge, to doctor and operate, to bury and flog, to pump, fumigate and scrape, and to load and unload. She called for so many skilled craftsmen, and provided so much special employment out of the way of seamanship, that the big crew was never big enough. The special employments took away now one man, now another, till there were few left to work the ship. The soldiers and marines acted as a military guard for the prevention of mutiny. They worked about the ship, hauling ropes, etc., when not engaged in military duty. The hundreds of men in the ship’s crew lived below decks. Most of them lived on the lower gun deck in the narrow spaces (known as berths) between the guns. Here they kept their chests, mess-tables, crockery, and other gear. Here they ate and drank, made merry, danced, got drunk, and, in port, entertained their female acquaintance. Many more, including the midshipmen, surgeon, and gunner, lived below the lower gun deck, in the orlop or cable tier, where sunlight could never come and fresh air never came willingly. At night the men slept in hammocks, which they slung from the beams. They were packed together very tightly, man to man, hammock touching hammock. In the morning, the hammocks were lashed up and stowed in racks till the evening.